Oh, I know, weekday voting is SO HARD! But until the Alex-Tourk-backed Why Tuesday? campaign to move our elections to Saturdays gets its way, Tuesday-impaired voters still have a couple of options to cast their ballots in the upcoming June 8 election, starting today. City Hall’s Department of Elections tells us that voters can vote at the Department of Elections office on the ground floor of City Hall as of this morning. Voting hours are 8-5 Monday through Friday (they’re closed on May 31 for Memorial Day), and you can even come in and vote from 10-4 on the weekends of May 29-30 and June 5-6. 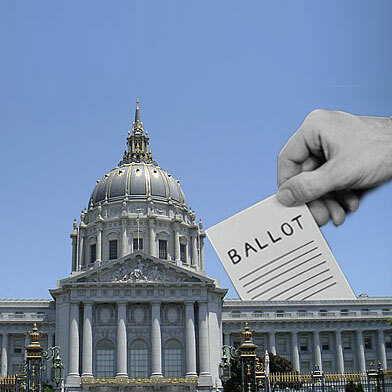 If a trip to City Hall’s out of the question, you can also vote by mail. To register to do that, fill out the form here by Tuesday, June 1 at 5PM and a ballot will be sent to you. If you have questions on your voter registration status, need a voter information pack, or have any other votey qs, the Department of Elections site probably has the answer, or you can call them at 554-4375.